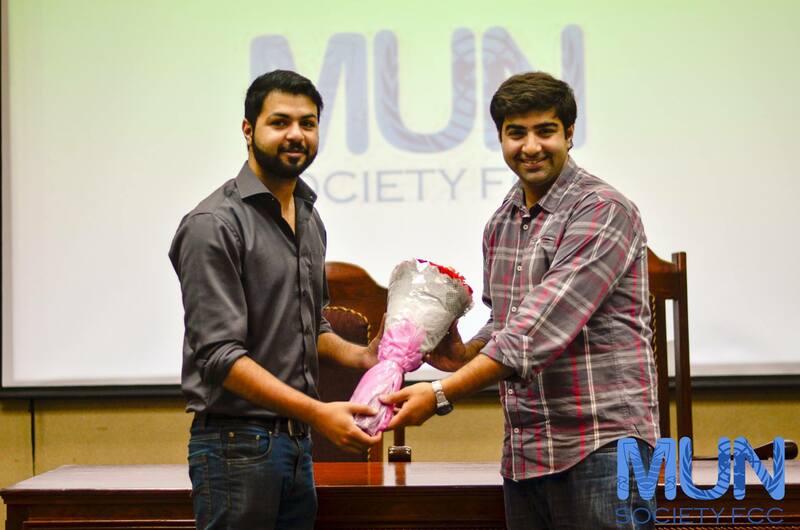 Continuing the MUN Summer Camp 2015 started by the MUN Society FCC invited Saad Sohail, winner of 14 best delegate awards including 3 LUMUNs and 1 WorldMUN to speak in How to Write a Working Paper, Position Paper and Draft Resolution. It was a good learning experience with a side by side question answer session. On 30 June 2015, Mr. Saad started by giving sample position papers, working papers and resolutions for the students to read and reference to while he explained. First writing position paper was explained in depth. He explained how position paper contained three paragraphs; first one consisting of a global perspective on the topic, second on discussing the country’s stance on it and third one should be on what the country is doing on it and what it looks for in the future. He stressed on how diplomacy was the key and how we can turn statements over diplomatically which depict unfavorable situations. The solution in position papers must be vague and the first opening speech of delegates shouldn’t be rigid. After that draft resolution was discussed and how it must be properly written. The formal vocabulary used in its statements was highlighted upon and sample draft resolution was understood and discussed. Interactive question answers held in between helped the students understand the concept in a much better way and after two hours of the session everyone felt well informed on the topic. Due to lack of time resolution paper could not be properly talked about, hence it shall be discussed in the next information session. This was session was definitely packed with valuable information which will help the future delegates immensely in their MUN-ing journey and give them a head start from others. This should be done again, because I think a lot of people wouldn’t have attended it due to summer vacations. Can we have this again. Please?